took a photo last week. lecture ambient sounds taken from a recording but heavily modified. Very cool game idea, sort of a narrative-puzzle-rythm game. I liked it! I enjoyed the humor! I like how whether it's in the writing or the sounds, the game is made of fun little details. It takes a simple idea and explore it in creative ways, that's really cool! I'm looking forward to streaming your game next week! Played it an Newgrounds, and like I said from there: "Great idea for a low budget, music class...". Cool concept. Liked the humor throughout. Not crazy about the wobbly camera. Would be nice if the 'exercises' were more musically oriented. By that I mean like guided. I couldn't seem to put any nice sounded beats together. I was just kind of hitting keys and making noises (programmer not a creative). I couldn't help thinking of a particular gif of someone playing a train simulator while on a train though, as I sat emulating tapping a desk and computer in front of my desk and computer. Thanks for playing Ryan! I got rid of that wobbly camera and if I get time I plan to add more ambitious features :) hahaha yeah, it's a vision of the future where we're all gonna be using VR to type on virtual computers! Clever! Especially things like picking up the pencil and drumming with it instead of hands. Love the humor too -nice work! Thanks! :) Where did you get up to? I just fixed a bug that might've prevented progress at the waiting part. OMG, I must be the worst classmate ever. Such a simple concept, but way too much fun. I think my favorite bit was the computer telling me what to do. Oh, that game was so funny. 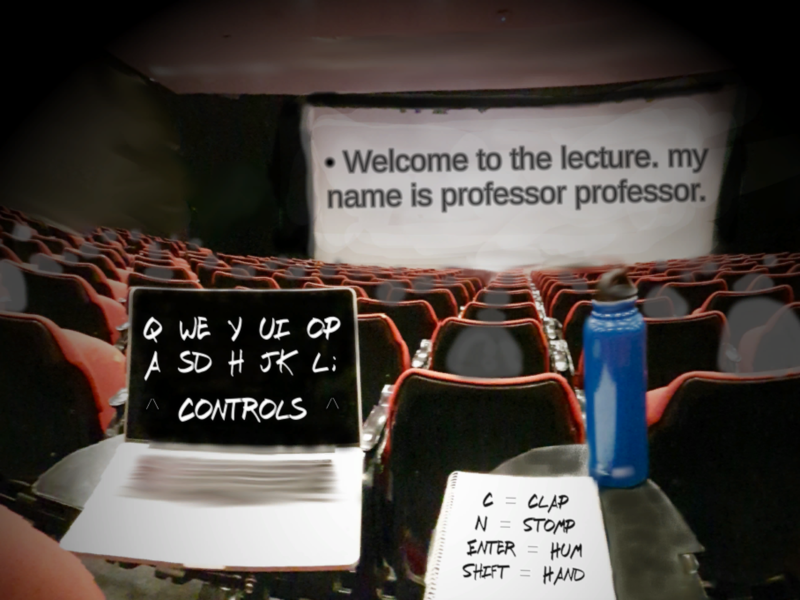 I would never be that guy in class but made what a fun idea. Delightful to play. I could rip up that water bottle all day.